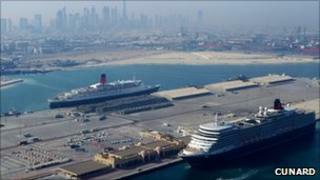 Ocean liners the QE2 and Queen Elizabeth have berthed next to each other in Dubai in their first ever meeting. Southampton-based Queen Elizabeth, currently on the return leg of its first world cruise, arrived at 0900 local time (0500 BST). After sailing to Dubai two-and-a-half years ago, QE2 remains redundant. The 293.5m (963ft) long liner is being kept idle but in a seaworthy condition in the inner harbour in Port Rashid. Plans to turn QE2 into a 200-room luxury floating hotel forming the centrepiece on Dubai's man-made Palm Jumeirah resort are on hold. The lights are still on and its nine engines - each the size of a double-decker bus - are still in running order, powering the lights and electricals on the ship. Onboard is a captain and a crew of around 40 who paint and maintain the former Cunard flagship which has carried almost 2.5 million passengers and completed over 800 Atlantic crossings. On 28 January QE2 moved unexpectedly, breaking from her moorings during a vicious sandstorm. Tugs returned the ship to berth without damage. Sold for £50m to the United Arab Emirates real estate developer Nakheel, QE2 left Southampton for the final time to an enormous send off on Tuesday, 11 November, 2008. Queen Elizabeth sails on Friday at 1800 local time (1400 BST). Both liners will sound their whistles in salute. QE2's former fleet-mates Queen Mary 2 and Queen Victoria have also visited in 2009 and 2010 during their world cruises.